Here is A brief primer on how to download ICICI Mobile application – iMobile app - on your smartphone and start using ICICI banking services right from your Mobile phone . You can register your mobile number with ICICI mobile banking at any ICICI ATM. You can also register at any ICICI bank branch by providing your identity proof. Non-Resident Indians (NRI) can download a registration form and send the duly filled form to ICICI office for registration. More information about registration can be found here. List of all cellphone makes and models supported by the ICICI Mobile Banking service can be found on this page. 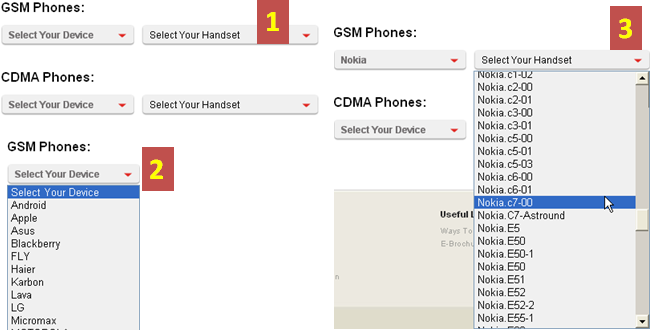 As shown in screenshot below, Select your phone make and check the model from the drop list under “Select Your Handset” Button. If your phone handset is LISTED in the list then see below for steps and instructions to get ICICI Mobile Banking app on your mobile. No generic version of iMobile is available like the SBI Mobile Banking application – State Bank FreedoM. Hence if your smartphone is not listed as explained above, at the best you can try downloading the iMobile app for a phone running a similar OS version as your cellphone. to get direct download link of iMobile on your cellphone. For some phones like iPhone and Android phones iMobile application can be downloaded from their respective app stores. Just search the app store for “iMobile” and download the application. Download ICICI Mobile Banking on to your Internet enabled smartphone through Mobile Internet (3G or GPRS or EDGE). On your phone browser open http://mobile.icicibank.com/dl . List of mobile makes will be available. Choose your phone handset make. Choose your model in the next page. iMobile application in the form of a Java application file (.jad or .jar file) will be downloaded to your cellphone. Visit http://mobile.icicibank.com/dl and select your phone make and model as explained above. iMobile Java app will be downloaded to your computer which can be then transferred to your mobile phone using your phone software via bluetooth or cable. For example, for a NOKIA handset, you can use NOKIA PC suite or OVI suite to install the iMobile Banking application to your NOKIA handset.